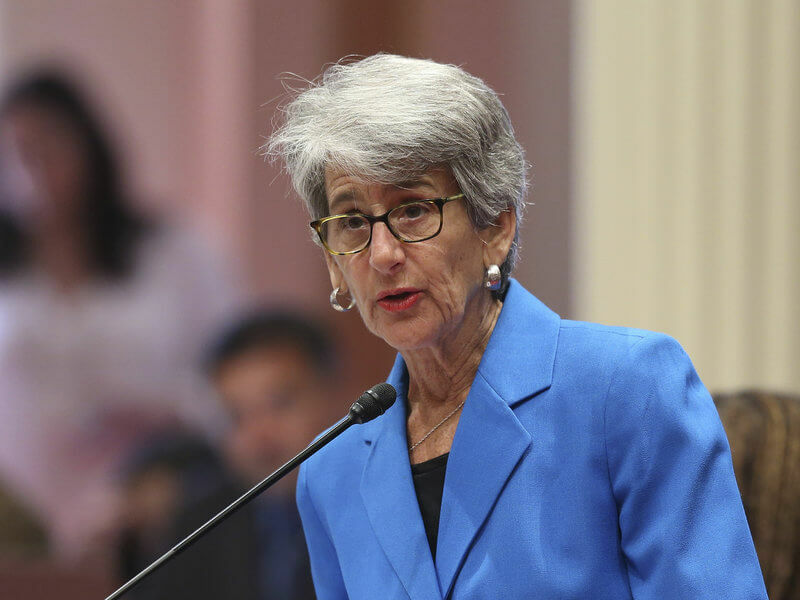 State Sen. Hannah-Beth Jackson addressed the California state Senate in August on a measure requiring at least one female director on corporate boards of publicly traded companies based in the state. On Sunday, Gov. Jerry Brown signed Jackson’s bill. Brown acknowledged that that have been “numerous objections” and “serious legal concerns” to the bill. California’s Chamber of Commerce and 29 other business groups opposed the it, sending a letter to the state senate arguing that the measure is unconstitutional, that it takes into account only gender and not other diversity, and that it seeks to manage the directors of companies that are incorporated in another state. “Such confusion and ambiguity will only lead to costly fines as proposed under the bill and potential litigation,” the business groups complained. Companies that don’t comply with the law will be fined $100,000; subsequent violations will draw a $300,000 fine. Just 5 percent of the companies on the Standard & Poor’s 500 (which includes only publicly traded firms) have female CEOs. According to The New York Times, women who have served as chief executive are far less likely than men to go on to be CEO at another company, and less likely to serve on corporate boards. One concern – that a small group of women would end up on many boards – turns out to be an issue with men on boards, too. The Economist also found that some of the benefits touted for increasing the number of women on boards – such as closing the wage gap between men and women, or having an effect on company decision-making – haven’t necessarily come to pass. The bill was one of Brown’s last opportunities to approve or veto before he leaves office due to term limits, The Associated Press noted. The approval also took place against the backdrop of the controversial Supreme Court confirmation process of Judge Brett Kavanaugh, who is accused of sexual assault more than 30 years ago. “Given all the special privileges that corporations have enjoyed for so long, it’s high time corporate boards include the people who constitute more than half the ‘persons’ in America,” Brown wrote. “It’s my hope that corporations, rather than fight this, will acknowledge its value and take the lead on pulling together and bringing greater diversity into their boardrooms,” she said.